Moodiness. Cramps. Cravings. Aches. Inconvenience. We wish we could magic all these terrible period symptoms away, but alas, Mother Nature is not budging on this one. But hey, anything that makes life a little easier for those red letter days (yes, we’re being sarcastic here) is fine by us. 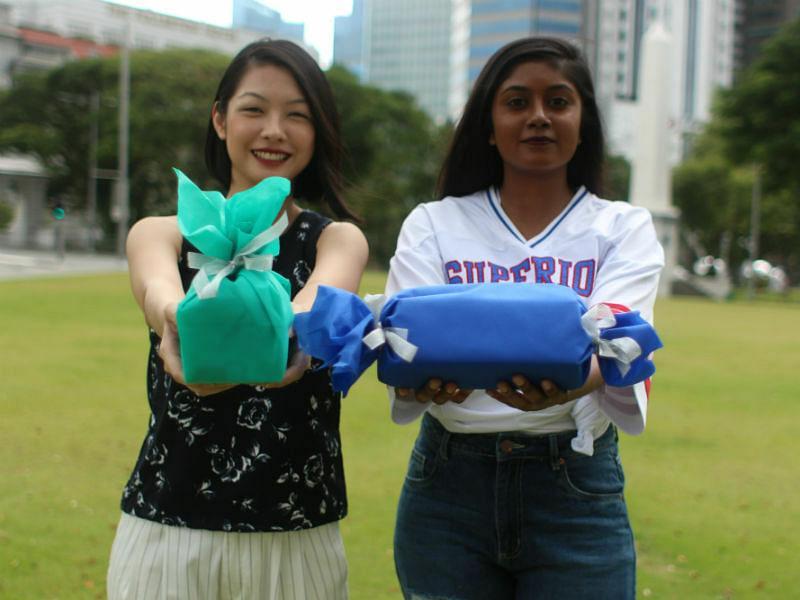 Period subscription boxes are not new in the international market, but local company Fempeers is currently the only one to offer this service in Singapore. How it works: head to their website and state your preference of pads or tampons (you also get to choose which brand you prefer!) and select what plan works for you (pay as you go, pay every three months, and pay every six months). Prices start at $32 per month. So here’s what came in our FemPeers kit when it arrived. All items come in a tote bag with different designs each month. All items have been through two focus groups, founder Kanika Agarwal tells us. Every month there will be five essential items that remain unchanged, but the others switch up depending on customer feedback – this is how your kit gets personalised, so if you don’t like something, contact FemPeers and make it known. 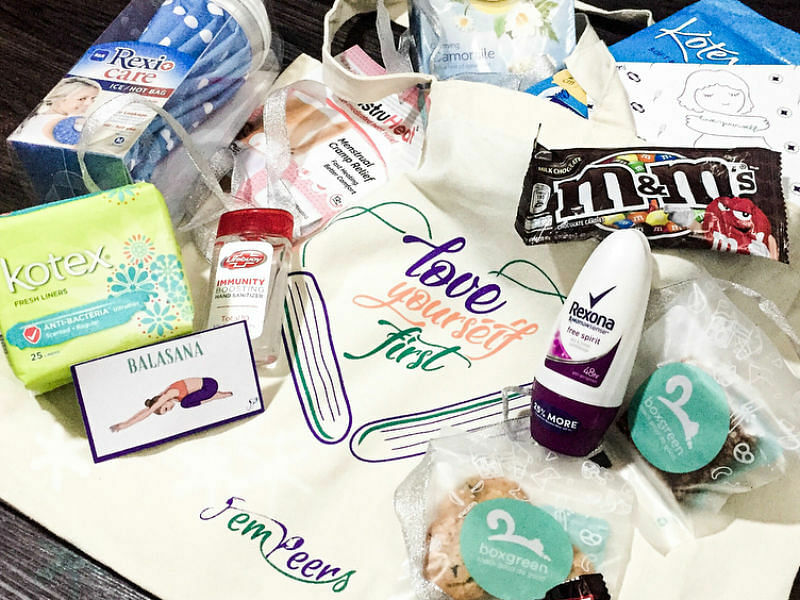 You’re paying for the convenience of tampons or pads delivered to your door every month, and a bundle of goodies that will last you for longer than the week your period comes (shout out to the hand sanitiser). 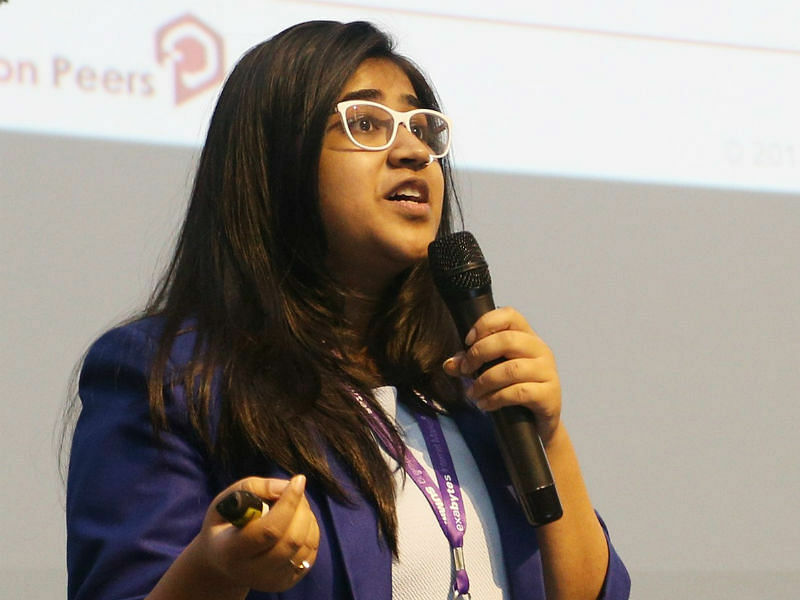 “My idea was to build a kit that’s truly your period companion, so you’ll always have your supplies with you everywhere you go,” says Kanika, who is also the CEO of digital strategy company Passion Peers. Almost the items are conveniently small and easy enough to slip into a small bag. But Kanika and FemPeers are looking at improving the lives of more than just the women who receive their kits. FemPeers has a buy-one-give-one business model, giving menstrual products to women in India with every box purchased. In Singapore, with a Guardian, Watsons and mama shop so readily accessible, when our period arrives unexpectedly it causes nothing more than annoyance. But Kanika realised that this was a situation that we were taking for granted when her helper’s 12 and 14 year old daughters started assisting her in cleaning. To her surprise, the reason given was that the girls, who just started menstruating, had stained their uniforms when attending school in India, and the cloth was destroyed. The solution would be unthinkable for most Singaporeans – their parents withdrew them out of school and they started working alongside their mother. “That’s when it hit me that mothers are limiting their daughters,” says Kanika. It wasn’t just the rural areas in India that were facing this lack of education about periods. “It’s a hush hush topic even in the metro cities,” says Kanika. “When one goes to buy sanitary napkins, it’s given in a black bag so we can hide it.” She discovered that 80 percent of women in India do not use sanitary napkins and 70 percent cannot afford menstrual supplies. 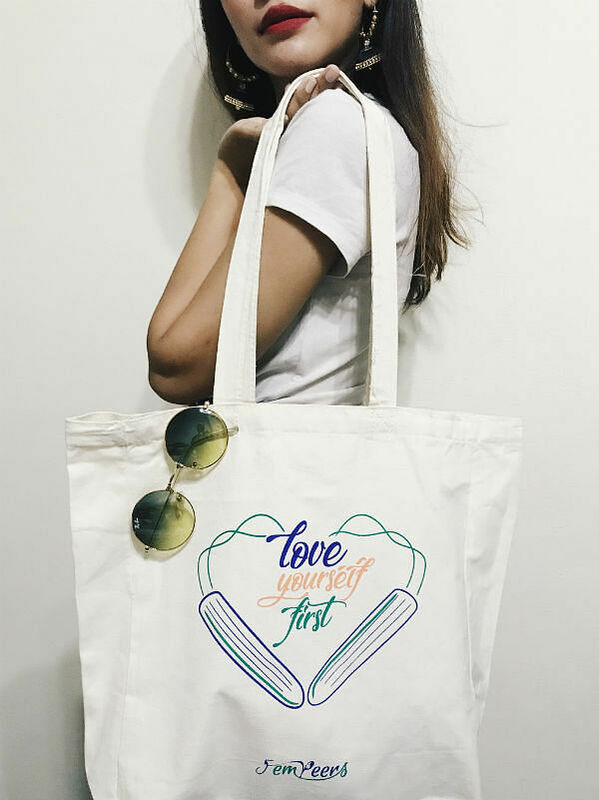 The totes are resuable and designed to spread the message. With this knowledge, FemPeers was created to start a conversation about periods, and to also aid women in India. To date, the company has impacted 134 women. By Menstrual Hygiene Day on 28th May, FemPeers will have reached out to over 300 women. And this is just the beginning – FemPeers will be launching in Philippines, Indonesia, Malaysia and India this year.